Corte Bella in Sun City West, Arizona provides all the luxuries of a Del Webb active adult community in a smaller, more intimate setting of 1,650 homes. 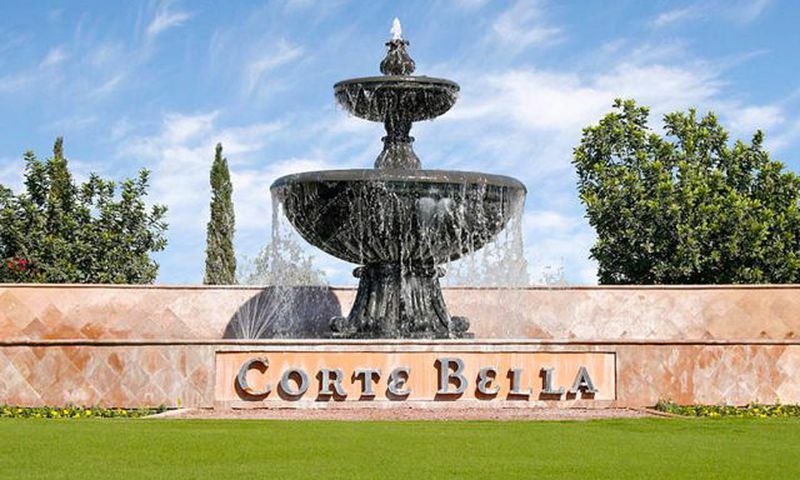 Corte Bella was uniquely designed based on feedback from retirees who wanted a small upscale, gated community with a private golf course. Corte Bella in Sun City West, AZ integrated an exquisite level of detail into every aspect of their community. Architectural inspirations range from Europe's casual street scenes to Santa Barbara's beautiful fountains, flowering courtyards, elegant archways and colorful mosaics. Tree-lined streets, walking paths, small neighborhood enclaves and expansive courtyards are community hallmarks. An 12,000 square-foot fitness center and spa is the community hub for fitness activities and classes at Corte Bella in Sun City West, Arizona. It features state-of-the-art cardiovascular and weight training equipment as well as an aerobics and dance studio. The spa pampers residents with massages, treatments rooms, therapy tubs, saunas and a sun patio. A 9,000 square-foot Social Hall provides magnificent views in all directions of the community and surrounding mountains. The hall is the epicenter for community social activity in Corte Bella. Here, residents mingle with friends, attend club meetings and gather for events. Outside Corte Bella's clubhouse, residents enjoy a magnificent resort-style outdoor pool with separate lap pool and spa. There are also tennis, pickleball and bocce ball courts. At Corte Bella, the golf course is the community's main attraction. Corte Bella Golf Club's classic layout provides an escape from the ubiquitous carries and target greens found in traditional desert golf courses. Lush ficus, Italian Cypress, Oleander and other exotic flora line the manicured Bermuda grass fairways. The 7,011-yard championship 18-hole course rewards strategic players. After a round of golf, residents enjoy mingling with friends at the Anacapa Grill. A wide variety of reasonably priced menu items for lunch, dinner and weekend brunches are sure to create a memorable dining experience. Homes in Corte Bella emphasize luxury and are adorned with quality, high-end finishes. Del Webb constructed Corte Bella between 2003 and 2007. All new-construction homes have been sold, but a continually changing lineup of pre-owned resale homes are available. Buyers can select from an assortment of ranch-style single-family homes that range from 1,100 to 3,200 square feet. Many of the homes feature desirable upgrades such as granite countertops, 3-car garages, casitas and oversized home sites with golf course views. Homes range in size with two to four bedrooms and two to three-and-a-half bathrooms. A community events coordinator and a fitness instructor are continually providing residents of Corte Bella with fun and exciting events, activities, interest groups and fitness classes. Popular clubs and activities include arts and crafts, card games, wine club, and other hobbies. There are plenty of ways to stay healthy with numerous fitness-focused classes and activities like yoga, Pilates, Zumba, tennis, golf, and more. Whether you are focused on social or physical activity, there is sure to be something that meets your unique interests. Corte Bella is conveniently located near many shopping outlets and cultural attractions in Sun City West, Arizona. Within 12 miles, residents can enjoy the Arrowhead Mall, Challenger Space Center, West Valley Art Museum, Wildlife World Zoo, Arizona State University-West and Lake Pleasant. Plus, sports enthusiasts will enjoy the proximity to sporting venues hosting local teams such as the Cardinals (NFL), Coyotes (NHL) and several Major League Baseball spring training camps. All residents are considered social members of Corte Bella Country Club and have access to the great amenities and clubs here. Full golf memberships are extra. Social Hall - 9,300 Sq. Ft. State-of-the-Art Fitness Center - 12,000 Sq. Ft. There are plenty of activities available in Corte Bella. Here is a sample of some of the clubs, activities and classes offered here. There were two floor plans offered in the Villas Collection. These homes are 1,155 to 1,282 square feet in size and feature two bedrooms, two bathrooms, and an attached two-car garage. There were four floor plans included in the Presidio Collection. These homes offer between 1,352 to 1,904 square feet. Most homes feature two to four bedrooms, two or three bathrooms, and an attached garage. The Catalina Collection ranges from 2,070 to 2,727 square feet in size. This collection featured four floor plans that offer two to four bedrooms, den options, two to three-and-a-half bathrooms, and an attached two or three-car garage. Offering 2,785 to 3,027 square feet of living space, the Miramar Collection featured the largest homes in two floor plans. These homes features two to four bedrooms, a den, two-and-a-half to three-and-a-half bathrooms, and an attached two or three car garage. After renting a home here this past year, I have literally fallen in love with Corte Bella. Last Friday I became a home owner. I've met the most open and friendly people from around the country and I've made new girlfriends in my neighborhood. I joined the pickleball club and a book club. I swim, take classes and use the spa services. I ride my bike everywhere, go to happy hour and still there are more things to do. In May I'll be on the bus to see the Diamondbacks vs Yankees game organized through Corte Bella. What a fantastic lifestyle within a community where I feel safe and secure. The review is misleading. The golf club is privately owned( not by the homeowners or HOA ). There is a fee to join and monthly dues including a monthly golf cart usage fee. Management caters to there members and for the most part homeowner non members are not encouraged to play here and are not really welcome. The golf club also had its own restaurant which competes with homeowner owned Anacapa. A beautiful development We looked at several over 50 communities and felt that Corte Bella was the best looking with lush plantings and best value. My husband and I finally got the courage to sell our big family home and move to Corte Bella last year. We are so happy with everything here we wish we would have moved sooner. First off, it's a smaller community, around 1,600 homes I think. That's much smaller than your typical big Del Webb communities in Arizona. It is very private and elegant with beautiful landscaping and fountains. There is a gate at the entry too so that really gives you a feeling of security plus it makes the community look like a real resort community. The clubhouse is nicely done with everything you'd need like a fitness center, swimming pools and a restaurant too. Everyday here has been like a vacation ... it's about time! We're loving it! 55places.com is not affiliated with the developer(s) or homeowners association of Corte Bella. The information you submit is distributed to a 55places.com Partner Agent, who is a licensed real estate agent. The information regarding Corte Bella has not been verified or approved by the developer or homeowners association. Please verify all information prior to purchasing. 55places.com is not responsible for any errors regarding the information displayed on this website.